Inside the temple, the Thean Hou Goddess sits majestically between the Goddess of the Waterfront (or known as Shui Wei Sheng Niang Goddess) and the Goddess of Mercy or known to the Chinese as Guan Yin. Statues of Milefo (the laughing Buddha), Wei Tuo and Guan Di (God of War) further contribute to this Taoist/Buddhist hodgepodge. 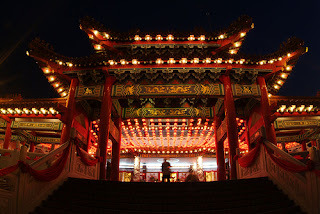 Thean Hou temple is located on top of Robson Hill off Jalan Syed Putra. Either take a taxi or bus No. 27 or 52 from Klang bus station and then walk up the hill. Interesting, but preferable to be more details about the God and Goddess, the historical facts about the shrines. A brief story of the statues. hello, your temple is very nice. i travelled to malaysia 2 years ago. and there was some wodden piece that we could have a horoscope with that. i like to have a horoscope with that but i don’t know how i can have a horoscope. would you help me? thanks.